10% Off Orders Plus Free Delivery for Club Members at H&M Sign up to H&M Club now and get 10% off your orders plus free delivery. Free Delivery on Orders For Club Members at H&M Sign up to H&M Club for amazing offers, updates and free delivery on orders. 70% Off Selected Home Ware at H&M-Cushions, Vases, Bedding & More Gorgeous home ware at H&M now up to 70% off, shop now! 70% Off Selected Menswear at H&M- Jeans, Sweatshirts and Coats Shop the huge reductions now in the H&M end of season sale. New In Women's & Men's Conscious Collection from £4.99 at H&M If you want to dress in fashion head to toe but also support the environment, shop H&M's amazing conscious range now made from organic and recycled materials. 70% Off Selected Kids wear at H&M- Coats, Shoes, T-Shirts & More Head over to H&M for huge discounts on kids clothes. Kids Cartoon and Comic Clothing from £3.99 at H&M Shop the cutest cartoon and comic kids range at H&M from as little as £3.99. H&M is the second largest clothing retailer in the world, ahead of Gap Inc., the largest American apparel retailer which owns the Gap and Old Navy brands, amongst others. There are thousands of H&M stores in dozens of countries, but the UK was the first country outside of Scandinavia to get its own H&M branches back in the mid '70s. Offering a variety of styles which are frequently updated to keep you on trend, you can save even more on the inexpensive prices of their lines with us. With everything from basic casual wear through to party wear and tailoring, H&M offers on-trend looks for everybody, and now getting the newest H&M looks, when you want them, can be even more affordable. Browse the range of current H&M discounts, offers and promotions at vouchercloud. Click 'View Deal' next to any H&M offer you'd like to use to see more details and get your code. Copy your code and click through to the H&M website. Browse and fill your shopping cart with the items you want to buy as normal. Click the Shopping Bag link in the corner when you’re ready to checkout. Sign in or register as a new customer, confirm your delivery address and delivery option. Enter your discount code when it is time to confirm your order. The discounts will be applied before you pay. Sign up to the H&M newsletter to get 25% off an item plus free standard delivery on your next purchase. What's more is you'll get all the latest trends and discount vouchers delivered straight to your inbox, do check the Terms and Conditions. Where is my nearest branch of H&M? H&M branches can be found all over the UK, and you can use the handy store locator on their website to find the one nearest to you. Standard UK mainland delivery is free when you spend over £50 on your order from H&M online. There is also the option for next day delivery for a fee if you want to get your hands on your new H&M clothing as fast as possible! How can I make sure I get the right size? H&M products are sold in UK sizes on their website and are also labelled with European and American sizes. If you are not sure which size to buy, check out their size guide here. Use your measurements to take the guesswork out of getting the perfect fit if you are unsure what size you need at H&M. Does H&M sell gift cards? You can buy H&M gift cards online or in their branches. E-gift cards, as well as attractive physical cards, are available. Online returns are available through Hermes pick up or via the Royal Mail. You can return items in-store with your e-ticket as proof of purchase. Take a look here for further details. Phone lines are open Monday - Friday 8am - 9pm, Saturday 9am - 6pm, Sundays & Bank Holidays 9am - 5pm. They also respond via their Facebook & Twitter page. For affordable and fashionable, high-street clothing - think H&M. Styling the UK and rest of the world, there is always something new in-store and online for both men and women at H&M. By using an H&M discount code UK from vouchercloud, you can get even better value while keeping your look up to date! Always collaborating with celebrities and designers - for dresses, jackets and all your seasonal threads - H&M is the best place to get the trends at low prices. H&M originally stood for 'Hennes & Mauritz'. The brand was born from the acquisition of a menswear brand called Mauritz Widforss by Swedish womenswear brand Hennes (which simply means 'Hers' in Swedish). 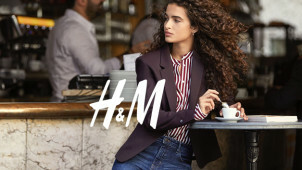 As the company branched out of Scandinavia and into other markets, the names of these original brands became less identifiable, and so the company rebranded to just H&M. H&M has the young and modern Divided range for women to browse in addition to the usual catalogue. New Arrivals are playful and bright, with florals and contrasting colours in dresses and more. Discover your new wardrobe for less using an H&M voucher code from vouchercloud. From workwear to partywear - the H&M Divided range will give you the perfect choice.